I’ve gotten quite a few questions about this lately, possibly due to Microsoft’s recent announcement about their new accessibility website and the launch of their KNFB Reader for Windows 10. What’s the Difference Between ADA Compliance and 508 Compliance? They’re pretty much the same, really. 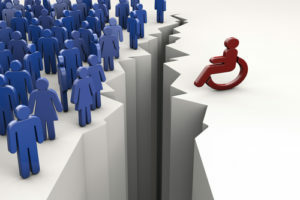 ADA is the Americans with Disabilities Act, and it refers to making all resources, both physical and digital, accessible to persons with disabilities. There’s no such thing as ADA Compliance when it comes to the web, it’s more about protecting a disabled persons’ civil rights. 508 Compliance by contrast is a set of standards created by the U.S. Government to apply to digital material. Officially, only government websites have to maintain compliance. However, most healthcare organizations and websites targeted to seniors make efforts to maintain compliance. You can too. What’s Involved in 508 Compliance? Keyboard vs. Mouse Use: All actions and interactions that a user can take on your site must also be accessible by using the keyboard. This means no mouse rollovers, no hover on commands that aren’t also accessible by using the keyboard only. It’s unclear at this time how this standard will impact swipe and pinch technology on mobile. Providing Text Alternatives: All text that is accessible within images, video, or otherwise must also be available in text form. This is so that a screen reader can access exactly the same information on the page as a visual user. All video or image based content must provide a transcript. Using screen readers: Tools for the visually impaired, like screen readers, must have indications when an interaction with the page is taking place. For example, if a drop down menu opens, the reader must indicate that the menu is open and tell how to close it. If an image is used on the page for something other than simple design, the alternative text associated with that image must describe the image. Selecting contrast and color: You must maintain a highly readable contrast (specific percentages are provided) and any use of color must be defined for the screen reader. Colors must be “web safe” and no CSS commands should change the browser’s native display such that a screen reader cannot translate it. Should You Become 508 Compliant? If your website is one that lots of persons with disabilities are likely to use, then the answer is easy – Yes. However, if your website is part of the mainstream, it’s a decision you have to make for yourself. But with an estimated 48.9 million people (19.4%) of Americans living with disabilities, are you willing to potentially eliminate those prospective customers?